Photo by Brent Kane for Martingale. Used with permission. Hi, guys! Remember my idea (mentioned on Instagram @piecedbrain) of having a Sew Along using the Modern Spools pattern from Peta Peace's book A Piece of Cake - Sweet and Simple Quilts from Layer Cake Squares published by Martingale? Well, I am ready to implement it - this quilt would look awesome in my studio! It would be so cool if you participated, too! I am thinking of making two blocks every two weeks. For my version, though, I will include sewing tools as paper pieced blocks inside the spools! 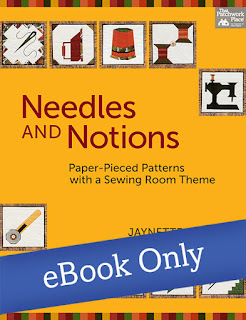 I will take the tools from the book Needles and Notions - Paper-Pieced Patterns with a Sewing Room Theme by Jaynette Huff. What do you think? Above are the notions which appear in the book. I am thinking of using the button jar, the seam ripper, the scissors, the rotary cutter, the cup and saucer, and the iron. Jaynette offers the patterns in 6" and 4" blocks - the 4" blocks will fit in perfectly. The other spools from the Modern Spools pattern would be empty. 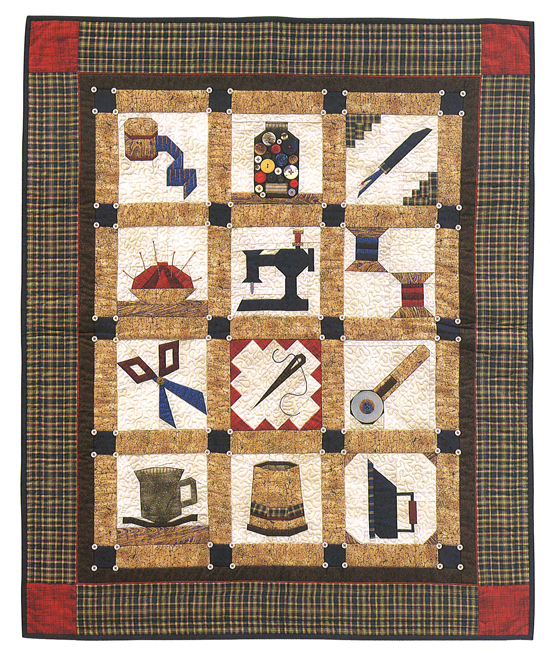 If you are not into paper-piecing, trace the shapes and machine applique' them. Wait, that is a really fun idea!!! We can use the fabric we like for this sew along: modern, 1930s, 1800s, etc. The first blocks will be posted on Monday, October 16 to give us all time to be ready. You decide if you want to include the notions blocks inside the spools or not. There are 23 blocks in this pattern and you can make it any size quilt using all 23 or less. - Sew Along using the Modern Spools pattern by Peta Peace. It measures 38-1/2" x 42-1/2" and the blocks finish at 5" x 9". 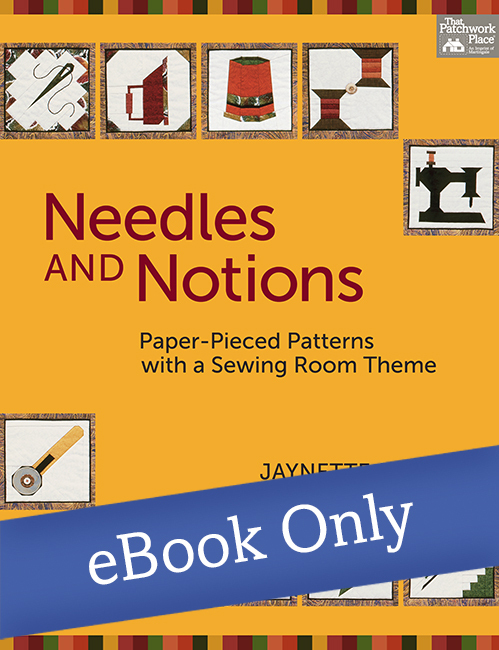 - Include notions blocks (or motifs) from Jaynette's book in a few of the spools, which can be paper pieced or machine appliqued. Or not! - Final quilt can be any size. Let me know what you think, here or on Instagram. It will be so much fun! 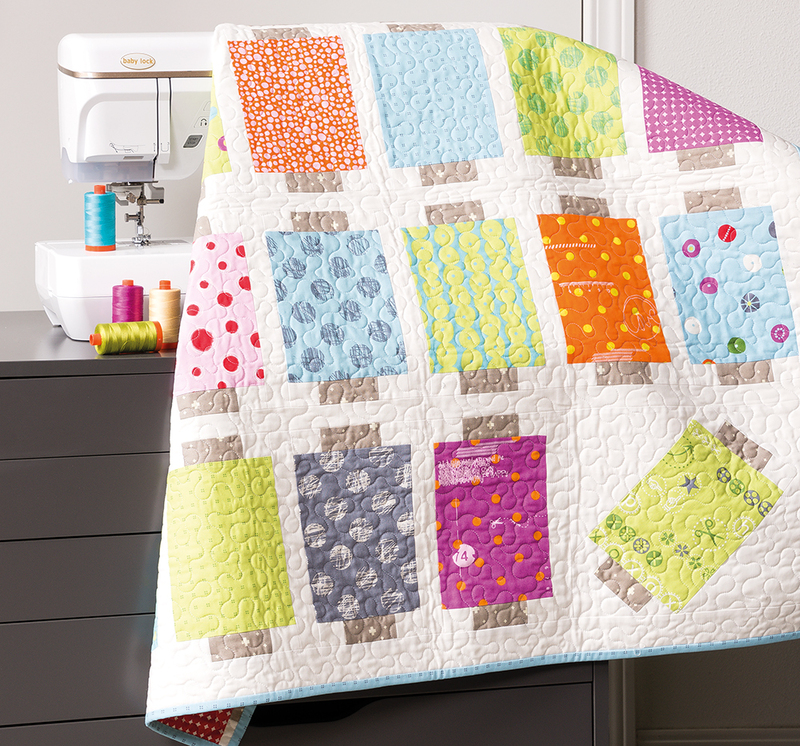 I like that Modern Spools quilt!The colors and the quilting make it look great! I am not a fan of paper piecing. I like the look, but not the sewing, so that other quilt would not be something I would make. Looking forward to yours! Do I need the book first? Yes, you need Peta Peace's book for the quilt pattern. If you do not want to get the Needles and Notions book, you need to look elsewhere for templates of sewing notions to add to some of the blocks (or all of them!). Those spools are sooo cute.